The aftermath of the attack. Picture courtesy of Zamboanga police. A grenade attack on a mosque in Zamboanga has killed two people, just days after the deadly twin-bomb attack on Jolo cathedral. The attack today (Wednesday, January 30) has stoked fears of sectarian retaliation, prompting the Malacañang to appeal for calm. Presidential spokesman Salvador Panelo said: “The successive attacks on two different places of worship depict the ruthlessness and the godlessness of these mass murderers. The grenade was thrown into the mosque shortly after midnight this morning, killing two Muslim preachers and wounding four others, all of whom were sleeping. The attack came just hours after President Duterte said the cathedral blasts that killed 21 people on Sulu island on Sunday may have involved suicide bombers. Today, Defence Secretary Delfin Lorenzana confirmed that the second of the explosions was “probably” a suicide bombing, but said it was not clear if Islamic State was involved, as it had not revealed the identity of the “martyr”. The Islamic State has claimed responsibility for the bombing, but the military believe it was the work of the Abu Sayyaf terror group operating independently. Lorenzana also told reporters that forensic tests would be carried out to establish if the suspected bomber was a foreign jihadist. If confirmed, it would be the second case of a suicide attack in the Philippines, following a van bomb last July on Basilan island, which killed 11 and was also claimed by the Islamic State. 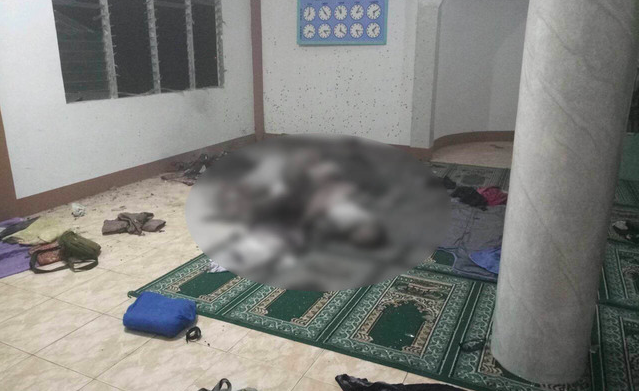 Zamboanga’s Ulama Council has described the Mosque attack as “devilish, irrational and inhumane”, while the regional governor has condemned both recent incidents, saying that targeting worshippers was the “highest form of cowardice and obscenity”. “We must stand united against the terrorists who would divide us and, thus, destroy all that we are working to build and establish in our communities,” governor Mujiv Hataman said on his Facebook page. The attacks follow the January 21 referendum that approved autonomy for the predominantly Muslim regions of Mindanao that will be called ‘Bangsamoro’. Among the surprise results of the plebiscite was a “no” vote by Sulu Island. All of Mindanao has been under martial law since May 23, 2017, when Islamist fighters over-ran Marawi City under the black flag of Islamic State. Some group/s are inciting a sectarian strife in the area. Some group/s are inciting sectarian conflict in the area.